(Tes-LEEM) means both ‘commit’ and ‘surrender’ in Turkish and features two well known Bay Area musicians: violinist Kaila Flexer and Gari Hegedus on oud, Turkish saz, Greek lauoto and other (mostly plucked) stringed instruments. 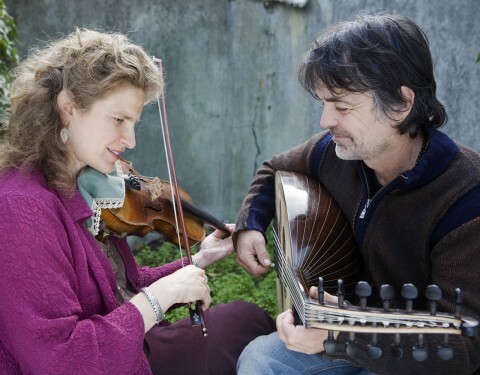 This potent duo performs Greek, Turkish and Sephardic music. In addition, both Flexer and Hegedus are composers whose original music is based on these fertile traditions. Both seasoned performers and recording artists, Teslim released its debut (self-titled) CD in December 2008. This unusual duo is at home in classical, early music, and folk music venues and holds workshops on a variety of topics. Kaila Flexer is a violinist, composer and music educator. In addition to performing and recording with Teslim, Flexer also performs with Shira Kammen and three other fiddlers in the Oakland Folkharmonic. Flexer founded and produced Klezmer Mania!, a much-loved annual Bay Area event for over 10 years (1989-2002) and currently produces Pomegranates & Figs: A Feast of Jewish Music. She has been at the helm of bands such as Third Ear, Next Village and Kaila Flexer’s Fieldharmonik, ensembles that featured her original material. She has performed both nationally internationally with her own ensembles as well as with groups including The Hollis Taylor-Kaila Flexer Duo, Club Foot Orchestra and KITKA Women’s Vocal Ensemble. In addition Teslim’s release, Kaila has recorded two CD’s of original music for Compass Records (Nashville). Flexer has a thriving studio of students of all ages. She encourages folk musicians to read music, classical musicians to improvise and to play by ear and everyone to enjoy music and to find and appreciate their own voice. 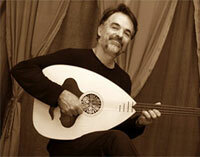 The oud is a descendant of the Persian barbat (an early lute). Pictured below is one of Gari’s ouds made by Yaroub Fadhel, an Iraqi luthier currently living in Tunisia. The 11 strings (including five courses of double strings and one bass string) are tied on the back of the instrument, as opposed to being tied at the bridge as they are on an Arabic or Turkish style oud. This instrument was conceived by Munir Bashir in the 1940′s to achieve a louder and more resonant sound than its predecessor. If you look closely you can see that the label inside the sound hole includes a photograph of the luthier himself. Saz means instrument in Turkish. There are three sizes–from smallest to largest they are: cura (pronounced jura) saz, baglama (pronounced balama, stress on the last a) and divan (pronounced deevan) saz. The saz has moveable tied-on frets made of nylon string. The frets are moveable to accommodate the pitches that occur in the makam system. The saz is associated mainly with Turkish folk music (not Turkish classical music) and has its own specific makam system that is different than the classical Turkish makam system. The frame drum is probably the oldest drum. It’s made of a skin stretched over a circular, usually wooden, frame. Different names for this drum include. def, tar, defi and bendir. Frame drums come in various sizes. The darbuka (also called a dumbek) is a goblet-shaped drum made of clay or spun aluminum or copper. The head is made of skin or plastic. This drum is found all over the Balkans, the Middle East and North Africa. Cocek (pronounced chocheck) 4/4 a common Romani (Gypsy) dance rhythm.